At least two former clients of Federal Emergency Management Agency (FEMA) Administrator William “Brock” Long have received FEMA contracts totaling more than $14 million since his arrival at the agency, federal documents show. The contracts raise “potential concerns with regard to his impartiality,” said one attorney with the Campaign Legal Center, a government-ethics watchdog group. Long joined FEMA in June 2017 after six years as executive vice president at Hagerty Consulting, a disaster consulting firm. The disclosure form for Long’s nomination lists both Booz Allen Hamilton and Eagle Hill Consulting as clients of Hagerty Consulting to whom Long “personally provided services,” each of which was responsible for at least $5,000 worth of income to Long. The form covers both direct payments from clients and indirect payments made via the filer’s employer. Long identified twenty Hagerty Consulting clients as sources of compensation exceeding $5,000 annually, but the form does not require filers to specify the actual amounts. Long listed his annual salary as $200,417. Sixteen of Long’s clients were government agencies or semi-public entities. The four private clients were Booz Allen, Eagle Hill, a California mall, and an Illinois music festival. Long’s disclosure form does not indicate when his work for Booz Allen and Eagle Hill occurred. Long was confirmed as FEMA’s administrator on June 20, 2017. Guidelines for the form require including all clients from the year of filing and the two preceding calendar years. If Long’s work for Booz Allen and Eagle Hill were done early enough in the reporting period, they would fall outside the scope of his recusal from matters concerning former clients for a period of one year after his last work for them. Excerpt from Brock Long ethics compliance form. On Aug. 26, 2017, according to Long’s ethics compliance form, he received an Office of Government Ethics authorization to deal with matters related to “former state and local government clients.” FEMA declined to release Long’s authorization, citing legal counsel regarding “possible sensitive information included in the documents.” A FEMA spokesperson said the documents would have to be obtained through a Freedom of Information Act request, which TYT has submitted. The agency did not respond to an email requesting comment and additional information. The following month, September 2017, Eagle Hill won a $53,239 contract from FEMA. Booz Allen got three separate contracts, totaling more than $4 million. This year, Booz Allen got a $9.6 million contract in January, a $82,000 contract in March, and a $293,695 contract on August 8. Marsco added, “Where former clients are concerned, there are always revolving door and favoritism concerns as well.” Marsco said the release of additional documents could shed light on the nature and extent of Long’s handling of the issue. Reliance by both Democrats and Republicans on private-sector disaster response, however, has brought Long and other public officials together with private interests such as Booz Allen. At a 2014 US Chamber of Commerce conference promoting public-private partnerships for disaster resilience, Long moderated one panel in his capacity as a Hagerty executive, while a Booz Allen official sat on another alongside Sunesis Consulting President Kirstjen Nielsen, now Long’s boss as Homeland Security secretary. At this year’s conference, featured speakers included Nielsen and Long–now in their government roles–and Booz Allen principal Patrick Beggs. In addition, Booz Allen bolsters its expertise in disaster response by hiring FEMA veterans. The head of the company’s emergency management practice is Marko Bourne, former FEMA director of policy and program analysis. Last month, Booz Allen registered with Congress to begin direct lobbying of the federal government. The new contracts come as Booz Allen is being investigated for past federal contracts. On June 15, 2017, Booz Allen revealed that it was under investigation by the Justice Department for possible billing irregularities regarding its federal contracts. The investigation later expanded to include the Securities and Exchange Commission. 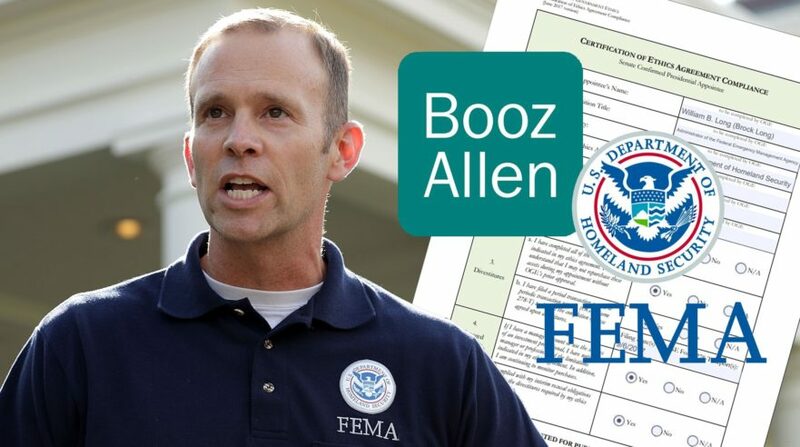 Booz Allen had FEMA contracts prior to Long’s arrival, but investigators have not publicly identified which agencies the probe involves. In February, Puerto Rico suspended a $133 million FEMA contract for recovery from Hurricane Maria. The contractor had won the bid with help from an executive whose nomination to serve as Pres. Trump’s second-in-command at FEMA was scotched last year by word of a probe into ethical issues around FEMA contracts related to Hurricane Katrina. As TYT previously reported, in FEMA’s after-action report from July on the 2017 hurricane season, Long concluded that “closer partnerships with the private sector are crucial“ for future disaster response. Puerto Rico last week updated the official Hurricane Maria death toll from 64 to 2,975. Follow Managing Editor Jonathan Larsen on Twitter.